Q: What does PAL offer youth? A: Local PAL's provide after-school and weekend activities in over 25 different organized sports and educational programs. Athletics is the draw but education and training are the priority. 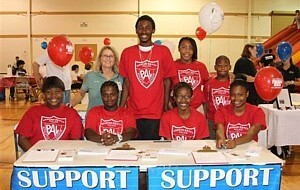 PAL's offer a safe, caring drug and crime free haven for our youth. Q: Who can participate in PAL? A: In most cities any youth age 8 years through 17 years can participate. Adult volunteers are also needed as coaches, tutors, and mentors. Q: How does PAL operate? A: In Florida most PAL programs are non-profit charitable corporations, sponsored by local Law Enforcement Officers and governed by a board of directors. Funds are raised through public contributions, grants, and the sale of the PAL specialty license plates. Q: Why are Law Enforcement Officers working with youth? A: Law Enforcement officers see youth at their worst and at their best. Law Enforcement officers serve the highest crime areas in our cities. Most important, Law Enforcement Officers go where others don't or won't to provide service to the youth who need it most. Law Enforcement officers care about our youth. A: Contact your local PAL chapter or call the State of Florida Association of Police Athletic/Activities League's office at (904)858-9737. You can email us at info@sfapal.com , or, write us at: P.O. Box 47497, Jacksonville, Florida, 32247. Get involved in helping "Fill Playgrounds Not Prisons." Q: What are some rules that apply to PAL sports? You may only use players that live within the county where your PAL is located. Overnight stays are allowed if the traveling distance is more than 100 miles and is approved by the State PAL Executive Director. State PAL shall enforce an 11:00 PM curfew when staying overnight. It is required of the coach or director to inspect the hotel rooms before check-in and at check-out. At tournament time, the Executive Director will appoint a committee, which he will chair, to handle any problems that may arise such as protests. Each PAL must submit a rooming list to State PAL by the deadline set by the SFAPAL office. If your PAL is found to have an illegal player, the player is immediately expelled and your PAL must pay a $200 fine to the State PAL before the next scheduled state tournament. A recommended ratio for supervision is 8 youth per one adult. Q: What will the State PAL pay for? A: (when approved): For the Youth Directors' Conference all expenses except transportation will be paid. Housing: SFAPAL will, in most cases, cover the cost of lodging for SFAPAL sponsored events only. Four youth in each room, two coaches per room and police officers may have their own rooms. (The curfew is 11:00 PM unless child is with a coach or officer).